In order to achieve optimum performance and reliability it is essential to follow correct procedures when it comes to cable management. Applying best practice will also help to minimise costs related to moves, adds and changes (MACs). The principles of good management for fibre patch cords are similar to those for copper network patch cords, however there are special considerations with optical fibre and extra care is needed in some areas. Why use optical fibre ducting raceway? Delicate optical fibre patch cords play an important part in many communications networks by transmitting large volumes of critical data and therefore need to be adequately protected and segregated from heavy electrical and copper data cabling. Optical fibre patch cords, which can range in diameter from 1.6mm, 2mm and up to 3mm for simplex patch cords, can be quite fragile and need to be properly managed and routed in order to maintain and ensure network reliability. Using traditional cable routing on open cable trays and ladders may cause damage to optical fibre cords. These methods of routing cables provide no protection for the exposed fibre and heavier copper cabling (power and comms) may crush and disturb fibre cables that are routed along the same path. Mixing cabling types can also provide a challenge for network operators, as locating, re-routing and accessing optical fibre patch cords can be difficult. Network downtime caused by bad cable management and damage to optical fibre patch cords can cost tens of thousands of dollars per second in lost revenue for each damaged cord. This can be avoided by using a fibre optic ducting raceway, thereby protecting your investment. The AS/NZS 3084:2017 Standard recommends that an overhead optical fibre trunking or ‘raceway’ system be used in equipment rooms to protect and support optical fibre cords. This is one of the main pathways for fibre optic patch cords in equipment rooms, where optical fibre patch connections are required between cabinets. What ducting raceway solutions are available? Warren & Brown’s (WB) optical fibre ducting raceway is an Australian made solution for managing, routing and protecting optical fibre cords between termination equipment, patch panels and splicing cabinets or frames in telecommunications exchanges, data centres, universities, hospitals, or anywhere optical fibre cabling is present. The unique design of the ducting system protects the optical fibre patch cords from damage and ensures that the bend radius of the cable is not compromised. 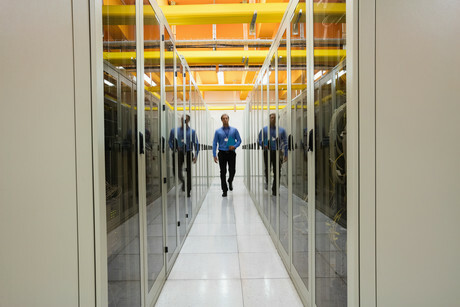 The ducting range has been designed as a robust and versatile solution that supports seamless growth, ensuring that data centres are future-proof. WB’s ducting range is made using a special fire-retardant Low Smoke Zero Halogen (LSZH) material certified to UL94V-0 specifications, while some other brands on the market are still using PVC. In the case of a fire, LSZH materials significantly reduce the amount of toxic and corrosive gas emissions, minimising harm to personnel, buildings and transmission equipment. Is it difficult to install ducting raceway? Easily mounted above equipment racks or below floors, it provides an easily accessible solution to any situation. The ducting raceway can be mounted from walls, ladder rack, unistrut, on raised floor support brackets, on floors, or to the top of equipment racks of frames. Components can be joined together using 2 methods, slotted joiners or slotless joiners. Slotted joiners require the use of a slotting tool and the ducting components to have slots on the ends so that it can be properly joined by clicking into place. Slotless joiners require no additional tooling or for slots to be made on the side of the duct and only require a screwdriver for installation to tighten the joiner into place. Vertical drops can be positioned or added easily by adding a cut-out in the horizontal duct raceway with a simple to operate hand tool or by using the express “over the top” drop option requiring no tools. How to choose the best solution for my network? The ducting system is currently available in three colours and seven sizes in a solid wall or slotted wall for exiting fibres, it is most important to select a size that allows for expansion and future additions to the ducting system. The most recent addition is the 600 x 100 ducting raceway system, providing maximum capacity of up to 7,500 2mm patch cords, based on a 50% fill rate. The ducting raceway can easily be customised and designed for your facility’s specific requirements. Standard yellow ducting is recommended for optical fibre, orange ducting is recommended for highlighting the redundant fibre networks and black ducting for CAT6A FTP or UTP 10 Gigabit copper. The capacities listed below are based on half full duct capacity (50%) and are recommended to ensure no damage occurs to the cords due to crushing. This is not the total number of optical fibre cords that can be accommodated if completely filled. With an impressive 400+ individual components and mounting hardware in stock locally, the range continues to grow and because it’s made here in Australia order turnaround is days, not months. Our future-proof ducting raceway solution is supported by our local R&D team, capabilities in network design and ongoing product support and training. In addition, Warren & Brown offer a full range of services including tool hire, free design / layout services, BOM creation, site visits and technical guidance. This versatile solution will ensure your network runs efficiently, and in combination with the support available, choosing Warren & Brown for your ducting raceway needs will help you achieve optimum network performance and reliability.